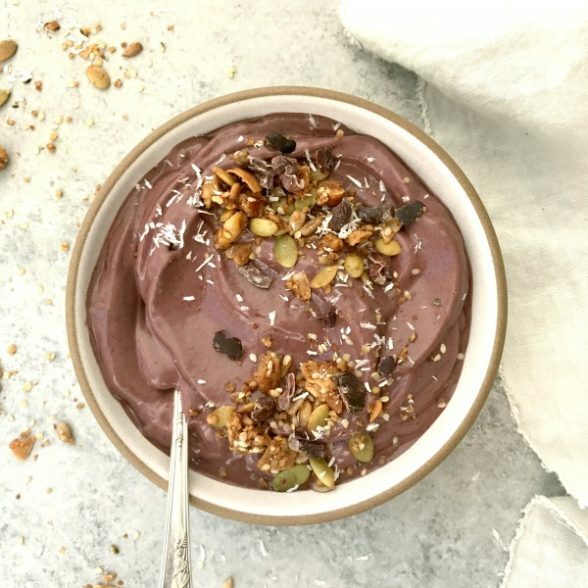 Is there anything better on a hot summer morning than a refreshing smoothie bowl, lightly sweetened and cold and creamy with the perfect toppings? I agree, nothing better. This smoothie bowl has been my go-to for the past few months and I just can’t get enough. Since the base of this smoothie bowl is acai, this can technically be considered an acai bowl, which is what I am calling it here. 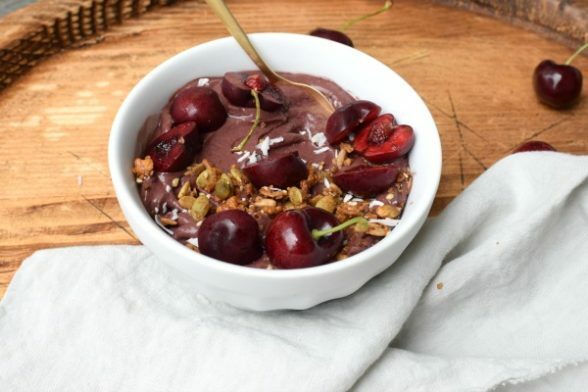 Acai is such a unique fruit not only in its composition (it has no sugar but contains healthy fat), but also in its flavor. Acai has a unique, very mellow-sweet, slightly tart, almost chocolatey flavor. Which is where the light bulb went off in my head to pair a packet of unsweetened acai with other things that love chocolate- cherries, banana, and peanut butter- and voila! My new favorite acai bowl was born! I have had the honor of being a spokesperson for the Northwest Cherry Growers Association, and quite honestly there couldn’t be a more perfect fruit for me to stand behind. Not only are cherries crazy delicious, but they are loaded with nutrition, too. There is actually a lot of new research and development in terms of the health benefits of cherries. Cherries contain very high amounts of antioxidants, and most notably of the antioxidant cyanidin, which is known for its role in reducing cancer risk. Cherries are also a good source of melatonin- which not only is soothing to the body and calming to inflammation, but aids in sleep, too. They also are good for lowering blood pressure, muscle recovery, and reducing the risk for alzheimers, among many other things. Since local cherries have such a short season, I enjoy using Northwest sweet cherries that are in the markets through the end of summer. These cherries are always so sweet and delicious, I never get a bad batch! The unique growing conditions in the Pacific Northwest are why these cherries are the best. 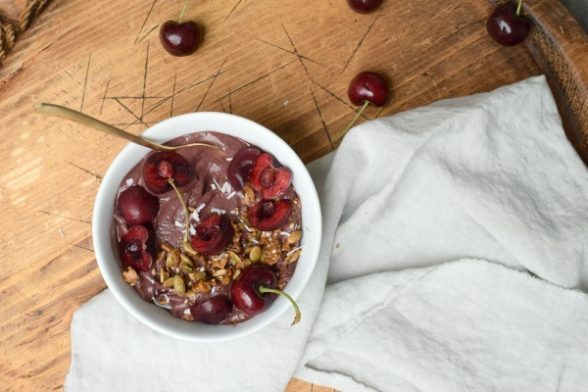 I also thought this would be a perfect recipe for this time of year, because not only can you snag those oh-so-perfect fresh Northwest cherries for toppings for the bowl, but also get a few pounds to stock up for when they are no longer available. I can’t wait to have the cherry craving hit and to know that I have a stash of these beauties in my freezer. 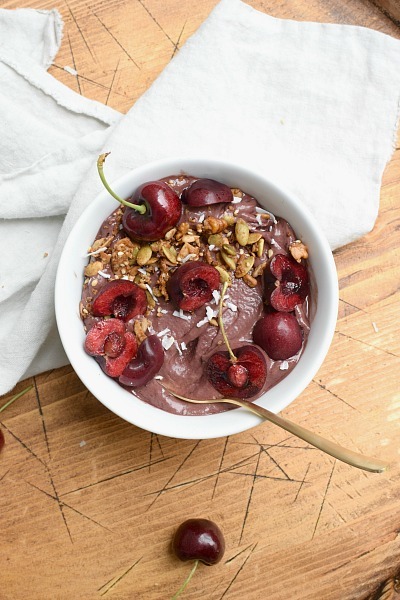 This acai bowl can easily be adapted to what you have on hand- if you want to throw in some frozen veggies like cauliflower that would work great, or if you wanted to swap out the peanut butter for almond butter that would be delicious, too. The toppings are extremely flexible too- feel free to add whatever nuts, seeds, and fruits you have on hand. Or, as noted in the recipe, add in your favorite protein powder or even a tablespoon of hemp seeds for a boost of nutrition for a more complete breakfast. Enjoy this with either fresh cherries while they’re still in season. Or buy a few pounds on sale right now and pit them and freeze them for a rainy day when you still wished it was summer. Add all of the ingredients to a high-speed blender and puree until smooth, but thick. A Vitamix does this very easily, but if you have a standard blender you'll just have to scrape down the sides every so often or use a food processor. Pour into a bowl and add toppings of choice. Serve immediately. You can add your favorite protein powder to make it a more complete breakfast. My 13 year old daughter loved this and asked me to let you know it’s a 5-star smoothie bowl. She topped it with (your) granola, coconut, and chocolate chips.